Farm-ily is on Facebook. It reached a milestone today. blogging is my first love in the social media world. to find that something special, something to be grateful for each day. It has evolved over nearly 3 years to so much more than that. and something that I really treasure. interacting with, connecting with, having conversations with. Thank you for your continued encouragement and comments. You really spur this journey on. What do you think of Facebook? Is Blogging still your first love? Congratulations! I've met some wonderful people and made some wonderful friends blogging... you being one of them! I have two FB personas, one mainly for family and the other for everything else. I get around rarely to looking at the one for everyone else FB, as blog reading and writing is the most important thing to me, after family. While I have said the same to others, you are recording history, capturing a moment, or some years, in time. In the year 3015, someone will google? farming, NSW, 2015 and there your images will be. I dislike fb. I only ever visit when an email tells me a family member has posted something. I love blogging though after 7 years ( I think) I don't post as often as I used to. Gold to celebrate with. Gorgeous and I am a sucker for windmill silhouettes. I do enjoy the blogging and find it hard to keep up with updating everything else as well. You have so many special moments and so much beauty in your life so thanks for sharing. Congratulations is in order then. I belong to Facebook, too, but I do not spend even a near a tenth of the time there that I do with blogging friends. I'll second what Laura said at the top! Love the pic. I have only put Garden Whispering on FB for awhile now. Found more people I know seem to read it. I saw your comment at Calamity Acres on Friday... your pictures are fabulous! I'm so glad you visited so I could find you! I love blogging but I have delated Facebook ! 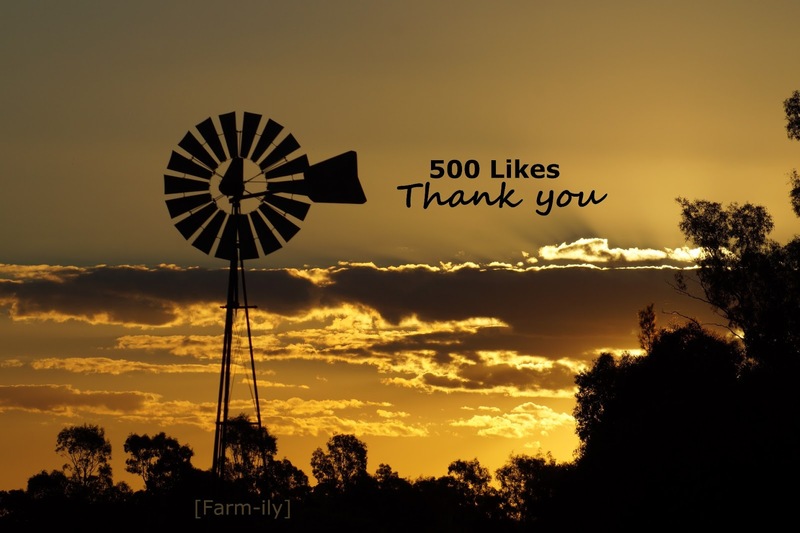 Congratulations on your 500 Facebook likes! That's lots of people enjoying the beautiful pictures you take. Keep up the great work. I like Facebook, but I don't separate my personal FB and my blog one. I find that posting my blogs to FB increases readership. The social media that I have found less success with is Twitter, though I realize I need to be more consistent with it. 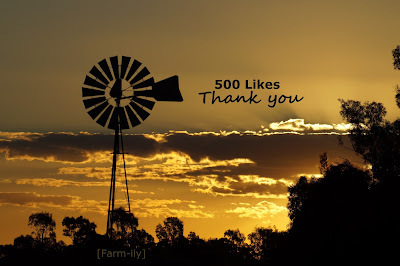 Congratulations on 500 likes. I'm so glad that our blogs have made us friends across the miles! I've made so many wonderful friends here.